With Friday's trade, the S&P 500 has now added a clean 1000 points to the March 2009 bottom, so the Fed can pat themselves on their collective back and declare "mission accomplished" at reflating the equities bubble. Stocks have no doubt now reached a "permanently high plateau" in our "new paradigm" since, after all, "a new economic equilibrium is emerging." Or something like that. Ironically, one thing that never seems to change is the human expectation that "this time is different." I think what's strange about this bubble is that most people actually seem to realize it's a bubble, probably because folks have seen enough of 'em over the past couple decades to recognize the hallmarks. Sure, there's a handful of Fed apologists out there, plus the occasional person insisting that the economy is in good shape and getting better every minute -- but even the majority of retail investors seem to recognize the rally is being fed by the Fed. Don't get me wrong, I'm still bullish as long as the charts point upwards and the Fed keeps feeding -- as I've said for months, there's no point fighting it -- but I don't believe the Fed has found the magical road to free money, or effected a fundamental change in the way the world works which will allow this to continue forever without consequences. Obviously, there's no way I can know if my assumptions are right or wrong; but either way, I call it as I see it. Later in this article, I'll update two long term-charts I haven't updated in quite some time: HYG and NDX, which I believe are both worth watching here. But first: In the prior update, I noted the Philadelphia Bank Index (BKX) chart seemed to contain a critical clue, and if that index was able to break out over 61.06, then we should expect the rally to continue. 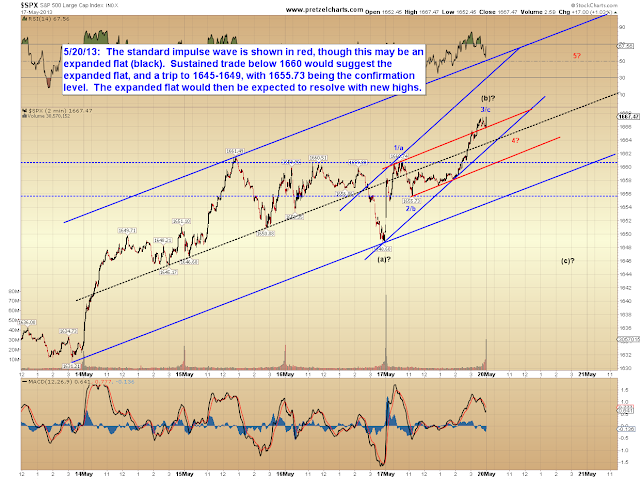 Of course, that doesn't necessarily mean the rally will continue immediately, and there will no doubt be corrections and pauses along the way, but presently it does appear likely SPX will ultimately find the 1680-90 target zone. Let's take a look at BKX first. 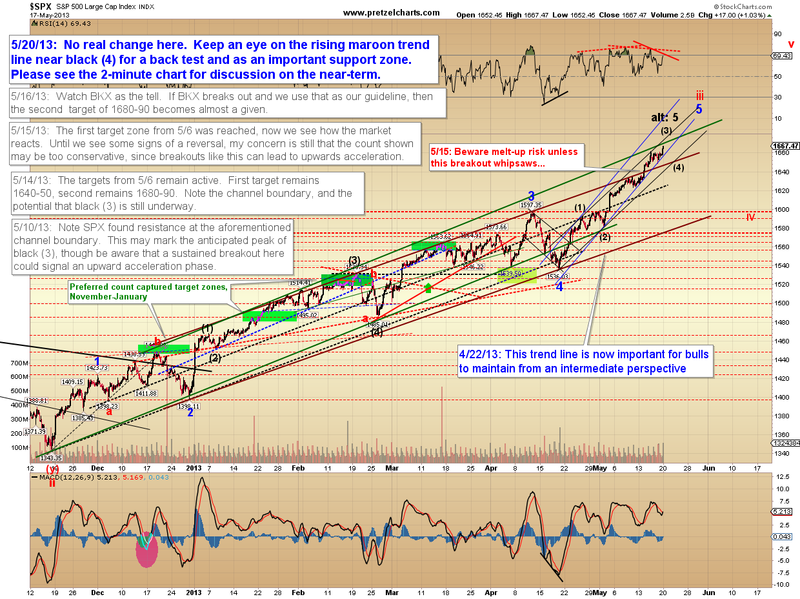 As long as support holds, it's hard to find anything to be long-term bearish about in this chart. The hourly BKX chart suggests at least one more fourth wave correction and new fifth high before a chance at any sort of meaningful top. Of course, there are always bear potentials extant in even the most bullish-looking chart (and vice-versa), so statements like that are based on what presently appears most probable. 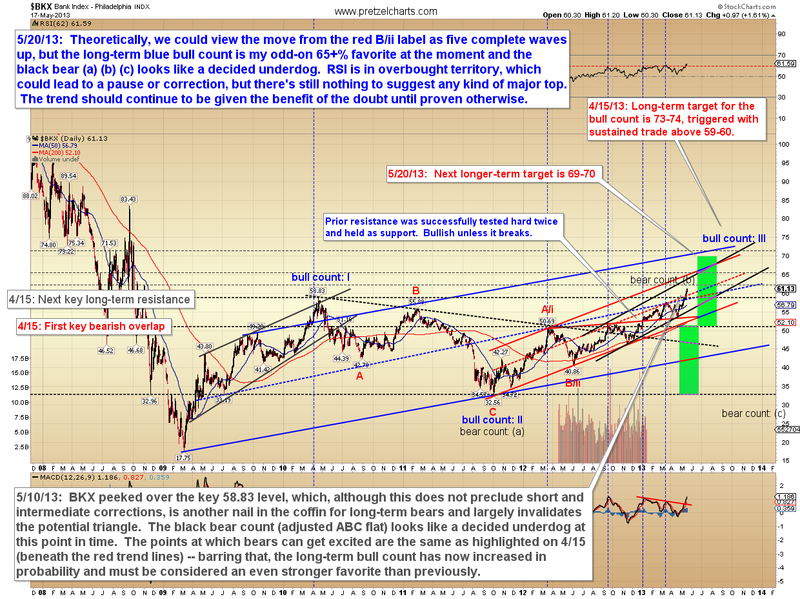 Trade below the "red 1" peak would cause us to more seriously examine the bear potentials. Finally, a long-term chart of HYG, the i-Shares High-Yield Corporate Bond Fund. Junk bonds tend to be an excellent barometer for equities, and this chart suggests that there is still more upside to come for equities over the intermediate term, because it's virtually impossible to count the rally as five complete waves. Depending on what happens to prices here over the near-term, there could be signals suggesting a considerable amount of upside remaining. HYG, which I've always facetiously imagined stands for "High Yield Garbage," has captured January's target zone. Four months ago, I couldn't see any bear counts which I felt were high enough probability to merit attention, so at that time I only published two counts: "bullish" and "even more bullish." However, the potential does now exist for the wave structure here to be complete or nearly so -- so we'll keep an eye on this going forward. Next is an attempt to decipher the Nasdaq 100 (INDEXNASDAQ:NDX) long-term chart. Note that daily MACD has now crossed over onto a buy signal (this is true on several other indices as well, including SPX), and is rising from an oversold position. 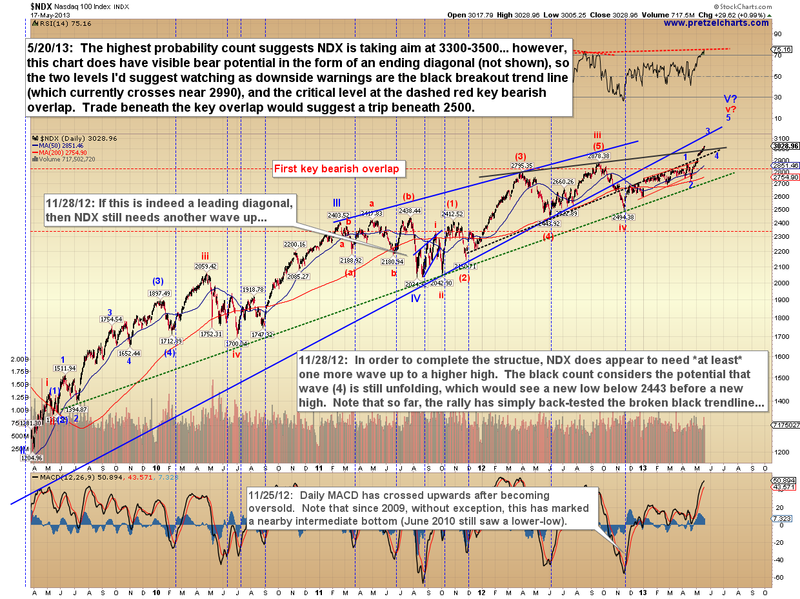 Also of note, it is difficult to count the rally since 2009 as a complete wave structure, which suggests at least one more wave up is due before a long-term top. 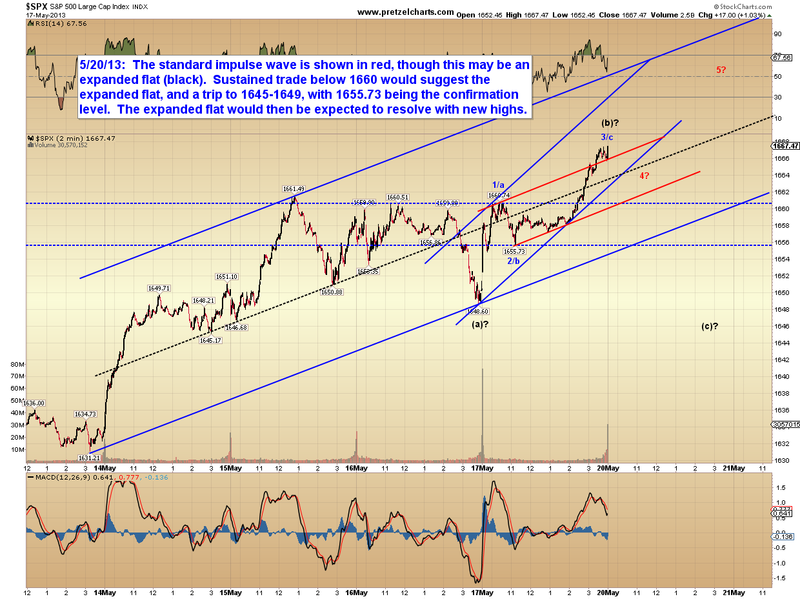 NDX is another one worth keeping an eye on. It has made the new high I thought it would, and the "most obvious" count here is still pointed higher. 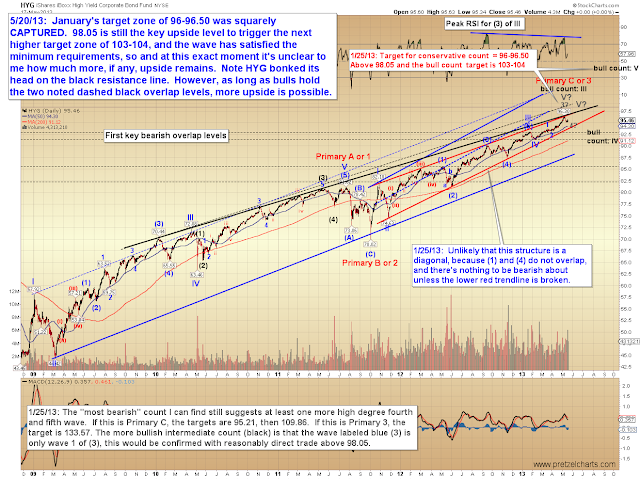 But this chart does have the potential for a series of 3-wave rallies into an ending diagonal, so I wouldn't suggest any level of complacency. 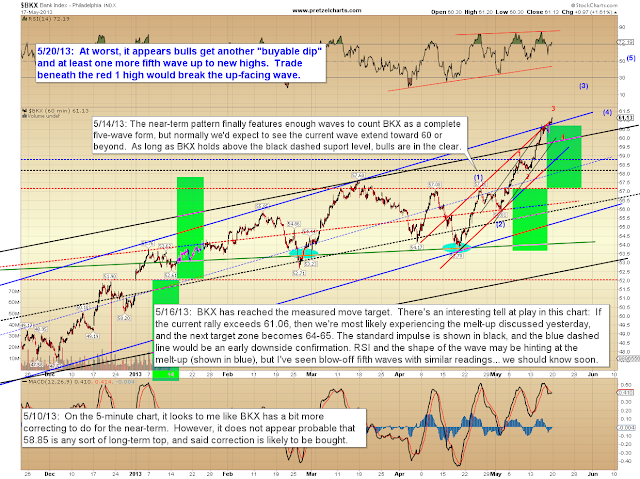 If the dashed red key overlap is crossed, then it will be time to get bearish on the bigger picture. SPX has the potential of an expanded flat for the near term, which becomes higher probability if 1660 is overlapped, and very high probability if 1655.73 is overlapped. In conclusion, based on BKX, I actually headed into this update "wanting" to be bullishly complacent. However, HYG and NDX are two charts which suggest complacency isn't necessarily a good idea here (as if it ever is! 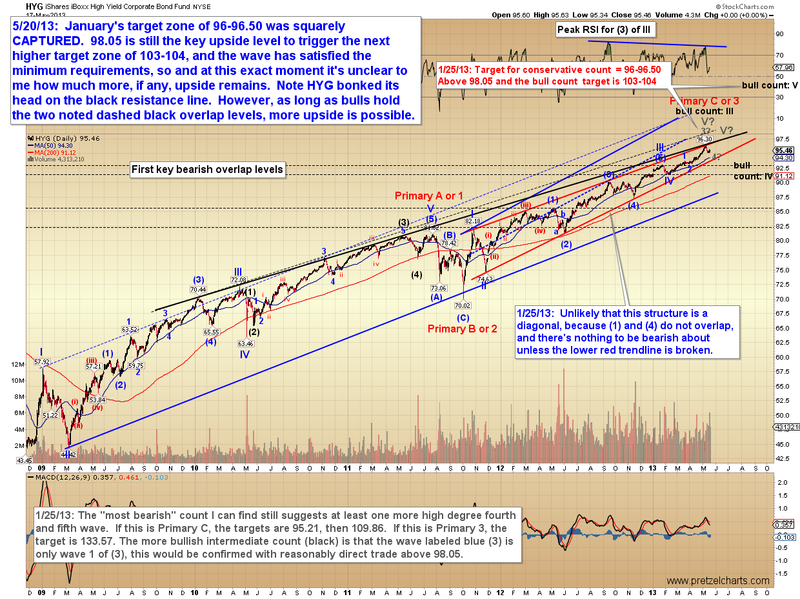 ), and it will be interesting to see if there's any psychological reaction to the 1000 point gain in SPX. 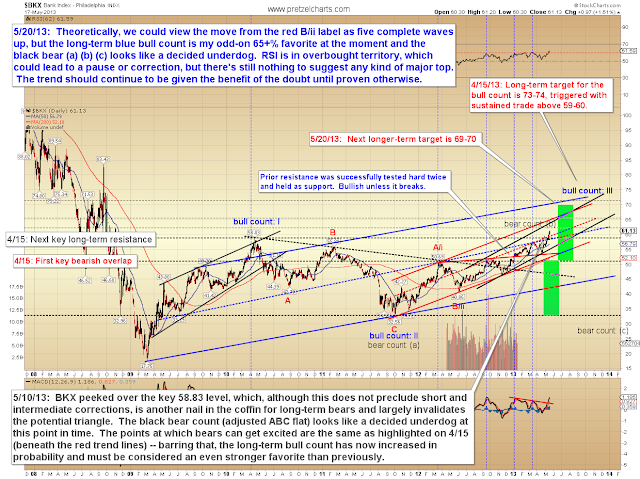 In any case, we have potential targets, and some clear levels to watch going forward. Trade safe. It is one specific simple way to make sure you recruit people.